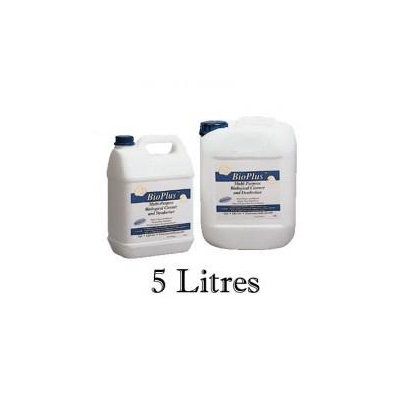 A highly active multi-functional product for surface cleaning, drain clogs, grease traps, septic tanks, animal waste and for controlling the toughest industrial waste treatment and odour problems. Use to clean washroom surfaces such and toilet fixtures, kitchen floors, carpets, vehicles, etc. BioPlus effectively seeks out organic wastes, inhibits the growth of pathogenic bacteria, clears the pipe and eliminates the source of even the most offensive odours. BioPlus is a cost-effective, quick acting multi-functional product that can also be used to clean and deodorize surfaces. BioPlus protects cleaned surfaces against new contaminants (including pests) and leaves them truly clean and pleasant smelling. After cleaning is completed, simply dispose remaining water into drains or sinks to remove build-up throughout the plumbing line of entire building and sewerage system. Always shake well before use. Do not apply disinfectants or sanitisers before or after BioPlus®. Doing so will neutralise the bio-enzymes bio-workers. 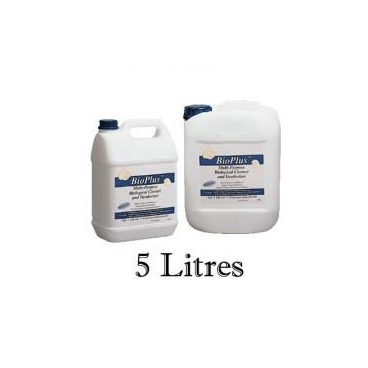 Floor Cleaner, Surface Cleaning & Deodorizing: Add 25ml to 5 liters with water (1 : 200) to wipe or mop floor surfaces. After cleaning dispose mop water into drains or sinks to enhance the biologically active solution throughout the plumbing lines. With each application, it penetrates into cracks and devices of floor surfaces to degrade and digest spills, grease, and other accumulated material leaving floors truly cleaner and a freshly scented environment. BIO-PLUS™ removes organic soils from floor grout or corners to make floors visibly cleaner and removing accumulated grease to reduce slippage. With routine cleaning, the effect is thus enhanced until floors are truly deep cleaned. NO RINSING REQUIRED - BIO-PLUS™ SAVES LABOR TIME AND WATER. Toilet Cleaner in Washroom: Add 1 part (25ml) to 20 parts water in a 500ml (1 : 20) sprayer bottle, spray liberally on surface to clean & deodorize. For toilet bowl, pour 9 to 18 capfuls (225ml to 500ml) into the bowl pipe and stand overnight. For heavy encrustations, use bowl mop or brush. By applying uniformly, particularly on areas where spills can occur, it allows the bacteria spores to degrade trapped and absorbed organic materials and at the same time, maintains toilet fixtures, walls and floors keeping it clean and fresh smelling. With continuous use, it clears drain pipes of odor causing and pipe-choking throughout the plumbing system. Drain Pipes & Grease Trap Maintenance: For drain lines, pour 225ml to 500ml (9 to 18 capfuls) into kitchen sink, toilet, shower, floor drain, etc and add 1 cup warm water to activate the product and stand overnight. Repeat in 2 or 3 days. For problem drains, check for obstruction and repeat daily until resolved and then return to maintenance dosage of 9 capfuls every 2 weeks. BioPlus® utilises naturally occurring bacteria and grease cutting surfactants to liquefy wastes and keep drains free flowing. BioPlus® works best when allowed to work uninterrupted or overnight when minimum drain water is discharged. Odour Eliminator: BioPlus® seeks out organic wastes and eliminates the source of the most offensive odours. It leaves walls, floors and other surfaces clean and pleasant smelling. Mix 150ml (6 capfuls) to 500ml of water to spray on surfaces with obnoxious odours like refuse containers, sanitary systems and carpets. Say Goodbye to Flies and Other Pests: BioPlus® protects cleaned surfaces against new contaminants and leaves them truly clean thus eliminating slippery floors caused by grease build-up and removes the food source for pests including ants, cockroaches and breeding of flies.